We are so happy with our star! It was so easy to assemble and lights up the sky for our Christmas display. I love these folding stars. I have bought 7 or 8 over the years. I use them year around for ambient lighting on my front porch. Nice star. Easy to use. The product was everything it was advertised to be. It looks very nice hanging on our house. We have gotten many nice compliments. Great product. Great light. Do not leave out all year - it falls apart. Purchased this in honor of my husband who passed away this year. The star is unique and looks wonderful. I am glad I purchased it. Came quickly. Easy to put up. All lights worked. The star was bigger than we thought! Yay! This star is wonderful! It arrives in a stack of five triangles. The star snapped together in seconds. The lights are very bright and present really well on the house. Very nice star. So bright that you can see it from a good distance away. I bought this star when it was on sale after the holidays. This star is flimsy star and difficult to keep open. The star is lightweight, but durable. The lights look spectacular. Replaced my old Christmas star with standard lights with the new LED light Star. Just what I wanted - brighter and same size as my old star. So far so good, a little flimsy but should do. Just received product...appears to be just what I wanted. Test will come this coming Christmas, as putting outside at peak of roof-line. Love that it is so easy to store...so compact. Love this star. The lights are a brilliant white. Tempted to buy another one. We enjoy the star and it works fine. Unfortunately, the packaging was not very sturdy and the star arrived damaged, with a crack in the plastic. Perfect for our needs and dealing with the company was a pleasure. Will return to this site in the future. Very happy with this product. It looks great. The product arrived broken and unusable. I searched everywhere for this star. Great product at a great price! I am very happy with this! In our hillside neighborhood about thirty homes have house to house, star themed holiday lights. 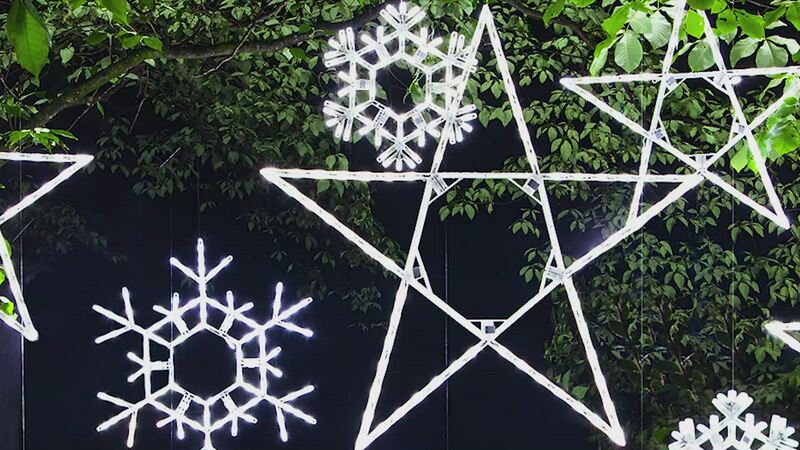 Next year I will be able to join in because of this easy to assemble, easy to store LED Star! I am very happy about this purchase! Big and bright, but not very well constructed. Half of the plastic clips that hold the lights fell off when I put the star on the roof; most of the others fell off when I took the star down. We love this star! It was so easy to use with no hassles, just plug in, and it's ready to SHINE! My husband was impressed with the quality and the neighbors comment on it. You can see it from a long way off and it fits in with our deck LED display. It's nice, one of the tabs keeps coming apart, but will deal with it. Star is large enough, wish the middle of the star had some lights. If I have any problem l will contact you. Arrived on time and as advertised. No complaints. I just ordered this Big Star for our barn, needed a big one to show up! It looks great, and we like it!!! Bright and stands out well!!! Product is easy to put together, little pricey, but nice. This is very nice, but ours arrived with several busted light holders and a broken hinge. Luckily, my husband was able to fix the star so we could use it. Very disappointed in the way the item was packaged. Did not expect this to be as good as it is. Will last for years. Packaging can be used for storage. Much brighter than expected. Reviewed by Mark F. S.
This star looks beautiful both near and far.It is Simple to use, just unfold it out of the box and you are ready to decorate.Positive recommendation to everyone looking for a large star.It arrived fasted then promised which was another great thing. The back of our home faces the road so we put this star on the railing of our 2nd story deck. It looks very pretty at night and the lights are very bright (they are the florescent white looking lights). I've only had it for 1 season but so far, so good. It folds up very nicely for easy storage. I love it! We Love this star that we just got this year. It looks beautiful close by and far away. The only problem we had was when putting it together the first time (which only involves unfolding it from the box), one of the plastic clips broke. It was still usable, and we did enjoy it all Christmas season. Once we took it down, we contacted the company to see if we could buy new clips, and they said they do not sell them separately. BUT they DID send us a New star to make up for it. FANTASTIC company in our eyes. I was very pleased with the purchase (50" folding star). We used it on our screened pool area. The description was accurate and I would recommend it. I absolutely, positively loved my Christmas star. It was light weight and attached easily to my house and I loved the shape. I used it in conjunction with my manger scene and receive compliments and inquiries about where I purchased it from. It fit perfectly in the area I used it in. Thanks for a great product! Reviewed by Cyndy J H.
I have the LED Folding Star hanging on my barn and it is visible from quite a distance. It is lightweight and so far has held up to snow and wind. Originally we purhcased a really cheap star from a big nat'l retailer. It was oviously this star wasn't going to work and would be a nightmare to store. So, i got on line and started looking. This star is durable, easy to store, and beautiful. Just perfect for the top of our garage..and you can see from far away. Very well made and worth the price. Nice and bright, able to see from a distance. I was really looking for a star closer to 8', but this one is doing the job. Reviewed by Pearl A. E.
We are well pleased with the quality of this star. Having lost our "homemade" star in a barn fire, this repalcement looks great at the peak of our new pole barn. It folds up for storage and is light weight. It is much less cumbersome than our old star which was made out of conduit and strings of lights. The LED's can be seen from about a 1/2 mile away. We have had positive comments from neighbors, friends and passers-by who like it. The LED star is beautiful. I love the size and convenience because of the folding. We put the star on the side of our boathouse and it looks wonderful! The LED folding star is just right for the space on our gable. It is bright and shines over the heads of Mary and Joseph and baby Jesus. I will be interested to see how long the plastic connecters last that hold the star in it's expanded shape. So far so good as they say. Really love this LED folding star, it is everything they say it is. Bright and beautiful!! Good product, but one of the tabs arrived broken, so the star would not stay open. I used a zip tie to fix it. Replacing the folding LED star we had for about ten years. This one is not as strong as the one we had but it is still close. It is still very good.